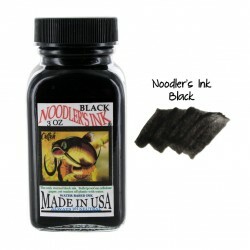 The ink comes with an imprinted Noodler’s card-stock box. "Bulletproof" refers to any Noodler's Ink that resists all the known tools of a forger, UV light, UV light wands, bleaches, alcohols, solvents, petrochemicals, oven cleaners, carpet cleaners, carpet stain lifters, and of course...they are also waterproof once permitted to dry upon cellulose paper. Some inks are more bulletproof than others - generally in descending order (most bulletproof with the most testing - to less bulletproof): blacks, blues, yellows, invisible ("blue ghost" and "White Whale"), greens, browns, purples, reds....all are equally bulletproof with one exception: the resistance to strong industrial bleaches to the point where the paper structure itself decomposes. Reds are prone to more fading when exposed to strong bleaches (sometimes fading to a yellow) than the other colors.